We need your help! We are looking for people that want to create and donate a poppy, to be added to a WW1 centenary banner as part of Westbury Arts Centre’s Banner Project. These banners will be included in an act of commemoration on 5th July at Campbell Park. This event will be a beautiful piece of dance exploring themes of conflict, involving over 100 dancers and moving around Campbell Park – everyone is welcome. 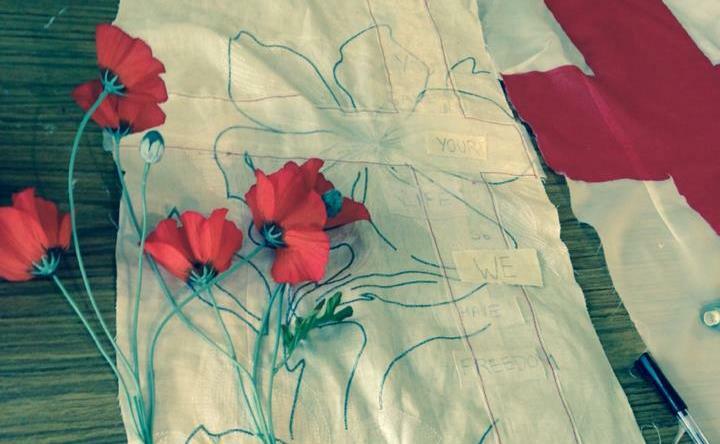 To get involved: Find some fabric and cut out a poppy using our template (or if you prefer, crochet or knit a poppy). You can add embroidery or sparkle and add the name of a relative or someone from your village that was involved in WW1. When you are happy with your poppy take a photo to remember it by (you can share on Facebook or on Twitter using #GreatWarMK) attach the slip from the Poppy Brief and send it to Westbury Arts Centre or put it into a Great War MK Poppy Box at your local MK Library by 12thJune 2015. We would also love to hear any stories that you have about relatives or people who lived in your village that served in WW1. The Poppy Brief and Poppy Template can be found here. Great War MK is a project exploring the impact of the First World War on the communities of Milton Keynes through research, commemorative events, activities and community workshops. You can see our upcoming events here.